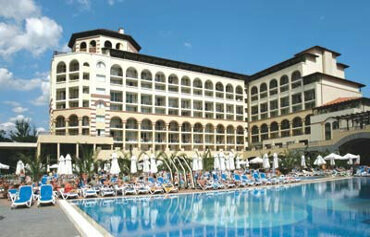 Holidays in Bulgaria are fast becoming a popular choice with British holidaymakers seeking a sunshine beach break. You only have to look at the name of the country's two main beach resorts to see why: Purpose built Sunny Beach in the south and Golden Sands in the north both boast long stretches of sand, water sports, shops, bars, restaurants and great value hotels. For a more authentic Bulgarian experience, head to the traditional ports of Nessebur and St Konstantin. Explore pine forests, pretty villages, Greek and Roman ruins and Byzantine churches in this fascinating country. Discover beautiful scenery and unique folk culture alongside modern resorts and facilities. A city break in Sofia, Bulgaria's capital, is the perfect mix of culture and nightlife, whilst the mountain resorts of Bansko, Borovets and Pamporovo are a huge hit for snowboarding and ski holidays. Why not book a holiday to Bulgaria this year and find out why it's so popular with families, solo travellers, couples and groups of friends. Fully renovated in 2010, this modern 4 Star property is built in a contemporary style and boasts good facilities on site as well as countless water sports and beach access nearby. The luxurious Barcelo Royal Beach Hotel is located in a prime position, in the heart of the resort with shops and entertainment on your doorstep, and only a minute away from the wide sandy beach. 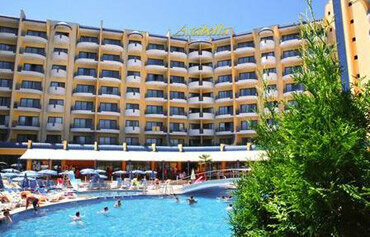 With modern, spacious rooms and superior facilities, this hotel is also a perfect choice for a family holiday. Perfect for families, this spacious complex is just a short walk from the centre of the resort and close to a sandy beach. There is a superb choice of facilities and activities on offer, guaranteed to entertain the whole family. This property offers guests quality accommodation in an idyllic beachfront setting The Victoria Palace has many facilities to assist your relaxation none more so than the splendid spa where guests can have a change from sunbathing by the pool. 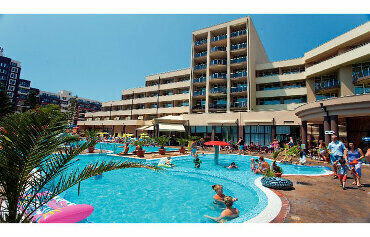 This conveniently located Golden Sands hotel is just 50 meters from the beach. Guests of the Marina Grand Beach Hotel Golden Sands enjoy easy access to a wide variety of water sports and beachside recreational activities. Situated in the heart of Sunny Beach, our biggest and most famous Black Sea resort, Hotel Neptun Beach is among the most renowned in the area. The Laguna Park enjoys a central location close to the beach; this well maintained hotel offers comfortable rooms and a friendly atmosphere; with a selection of on site amenities and facilities. Opened in 2005, this wellsituated luxury hotel has excellent hotel and room facilities, a high level of service, and a total of 726 rooms. Facilities include an airconditioned foyer with a 24hour reception desk, a currency exchange, public Internet access, and 8 lifts. 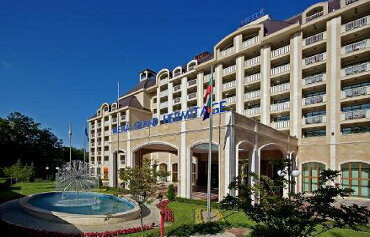 The popular Black Sea coast resort of Sunny Bay in Bulgaria is home to the Alba Hotel, set close to the promenade and only 50m from the long beach. The 4star Alba Hotel presents a choice of 200 double rooms, apartments and studios and welcomes singles, couples and families. Opened in 2001, this hotel comprises a total of 292 rooms spread over 7 floors. 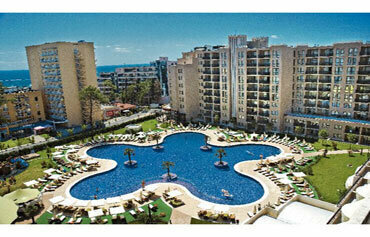 This total includes 2 apartments, 24 elegant suites and 14 junior suites. Bulgaria's weather is one of its main attractions. The country enjoys a hot and sunny climate in the summer months with average temperatures reaching upwards of 26ºC and 11 hours of sunshine per day. 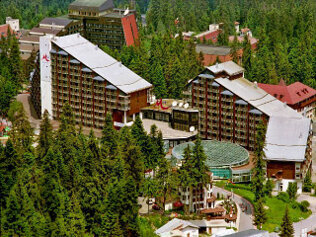 Winter sees a much cooler climate with snow showers frequent inland and ski resorts such as Borovets enjoy snow well into spring. The mild climate continues in the coastal resorts continue during the wintertime, with 3 to 4 hours sunshine and temperatures as high as 10ºC. 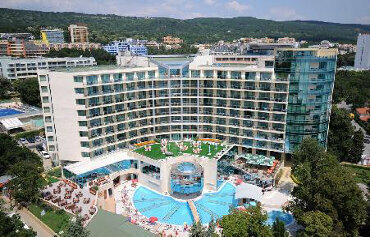 Holidays in Bulgaria are packed with things to see and do. 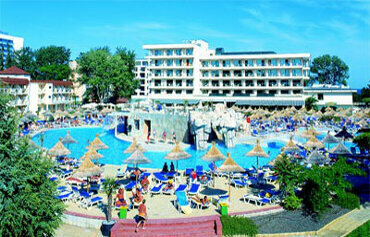 Bulgaria's long beaches are perfect for water sports and you'll find plenty on offer in the main resorts. There are also plenty of relaxing Black Sea boat trips to be taken. Inland, try quad biking, 4x4 safaris, horse riding and hiking. 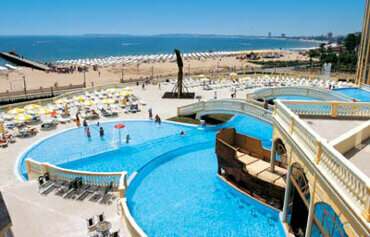 The water parks at Sunny Beach and Golden Sands make brilliant family days out. Shopping in Bulgaria is great value for money whether in the cities of Varna and Bourgas, resort souvenir shops or traditional craft markets. For a lively night Sunny Beach and Bourgas have a great selection of bars, restaurants and discos pumping out everything from 80's disco to modern sounds. 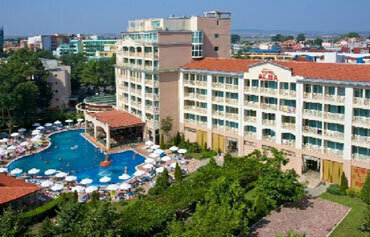 Sunny Beach is popular with families but its nightlife also attracts groups of friends. Away from the bigger towns and beach resorts, nightlife centres on small handfuls of bars and restaurants that pepper the seafronts. Don't miss the Folklore evenings that take place at many villages and resorts in the Black Sea coastal region. In the winter in the mountain villages, the aprs ski centres around the traditional stone and wooden buildings which house traditional drinking taverns. Bulgaria has a good selection of restaurants, ranging from cosy, folkstyle eateries serving local dishes to modern fast food joints. Local specialities include 'gyuvech', a tasty stew stuffed with meat, peppers, aubergines and beans and 'Kavarma', a spicy meat stew that's a bit like Hungarian goulash. Indulge a sweet tooth with sticky Baklava or enjoy sugardusted Turkish Delight. The local wines including Riesling, Merlot, Cabernet are worth sampling.